A plaque at 1335 Sutter Street notes the building’s history. 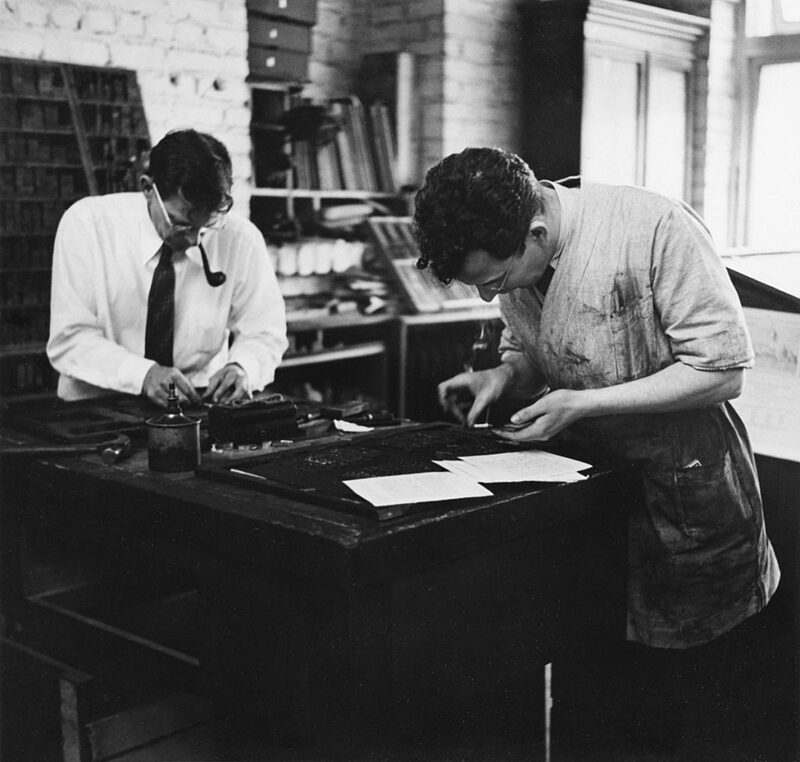 Brothers Edwin and Robert Grabhorn founded their Studio Press in 1916 in Indianapolis. 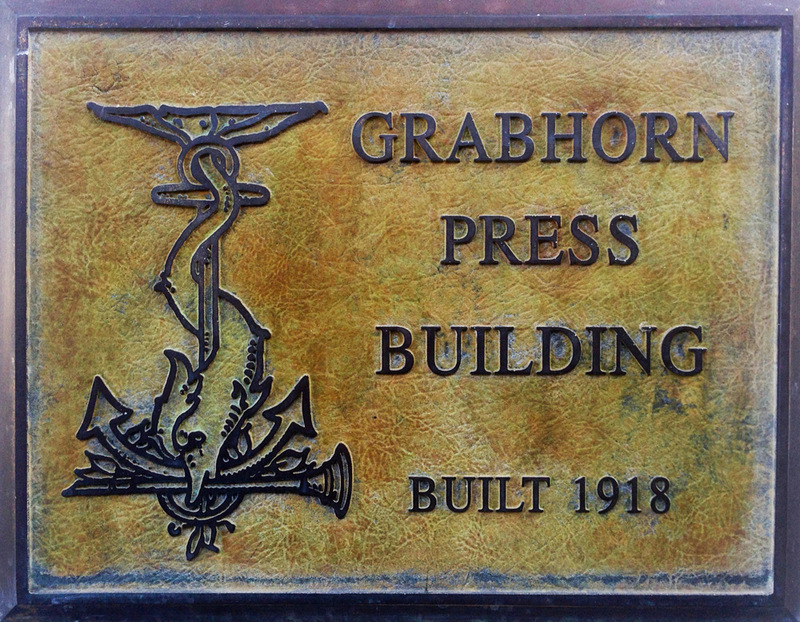 They moved to San Francisco in 1919, and a few years later their enterprise formally became known as Grabhorn Press. During that time, California was becoming a hub for small, craft-driven print houses. The Grabhorn brothers soon became among the state’s most respected specialty printers. Working in the tradition of Arts and Crafts, and drawing from the work of 19th century British writer and designer William Morris and his Kelmscott Press, the brothers carefully and beautifully printed limited editions of Shakespeare’s plays, Whitman’s Leaves of Grass, Hawthorne’s The Scarlet Letter and Crane’s The Red Badge of Courage, to underscore a few projects. The American Institute of Graphic Arts recognized their achievements with a gold medal in 1942. Brothers Robert and Edwin Grabhorn setting type by hand at Grabhorn Press’s offices. After working out of several structures clustered around San Francisco’s downtown area, the Grabhorn brothers settled into the building at 1335 Sutter Street in 1942. They remained there until the press closed its doors in the final months of 1965, when Edwin’s health was in decline. Setting up shop, the brothers found the San Francisco climate conducive to printing. Since keeping paper from becoming too dry was a priority, the damp weather was a boon for business. Edwin recalled that the first book they printed in California was The Gracious Visitation, by poet, supernaturalist and ghost-lover Emma Frances Dawson. The Book Club of California commissioned several books each year from the area’s finest presses, including Grabhorn. As the brothers’ client list expanded and they became more prosperous, their need for a permanent location became critical to the continued health of the business. 1335 Sutter (left) was designed in 1918 as an annex to the adjacent temple school (right). In 1942, Marjorie Grabhorn, Edwin’s second wife, purchased the building at 1335 Sutter Street. It had been designed in 1918 by Alfred Henry Jacobs (1882-1955) as an annex to his earlier, adjacent temple school for the Congregation Emanu-El. Jacobs, who was a California native, studied at Berkeley, the Massachusetts Institute of Technology and the Ecole des Beaux Arts in Paris. He was known for his San Francisco theater buildings, including the California Theater and the Granada-Paramount Theater — both of which have been demolished — and the Curran Theater on Geary Street. One of Jacobs’ most unusual designs is the Winema Theater, constructed of redwood logs, in Scotia, California. A company town of the Pacific Lumber Company, almost all of Scotia’s buildings are constructed of redwood. The 1335 Sutter Street building is a two-story brick structure with a basement. Its squat, fluted Doric columns give the building a classically inspired style. The second story is set back behind a mansard roof with skylights. This atypical arrangement gives the building a strong street presence beside its earlier neighbor, which also has bold Doric columns. The adjacent, affiliated building was designed by Jacobs to accommodate a large meeting hall; it has a third story and appears larger in scale. When the Grabhorn Press occupied 1335 Sutter, the street level floor served as the pressroom, while the second floor housed an office and the book bindery. The basement afforded a desirably damp storage area for paper. 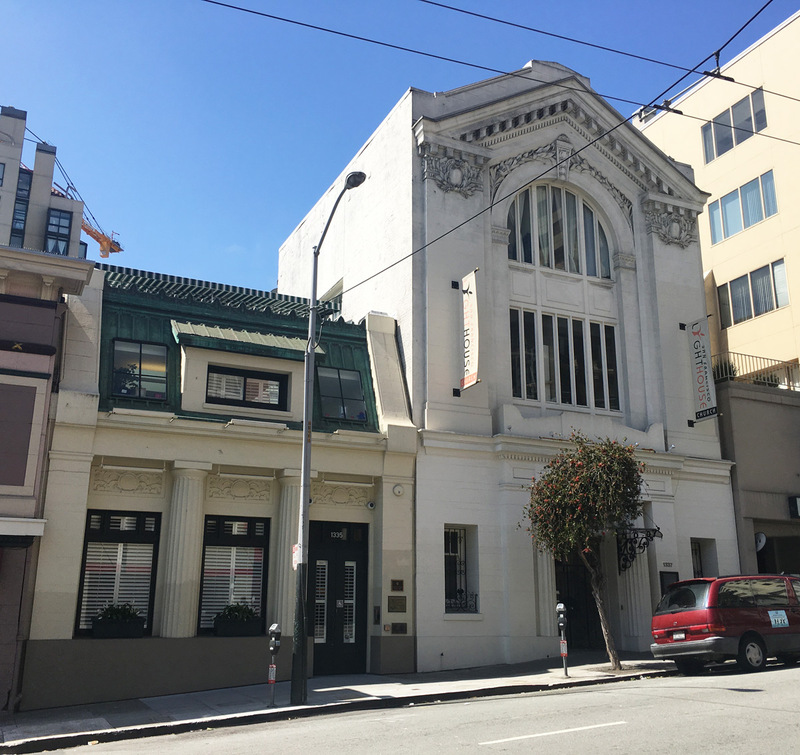 After the temple school moved to the current site of temple Emanu-El at Lake and Arguello Streets, the buildings at 1335 and 1337 Sutter were owned and used by Rosenfeld’s Sons Realty Company until 1335 Sutter became the home to the Grabhorn Press in 1942. A few years before Edwin Grabhorn’s death in December 1968, the brothers donated their collection of 1,600 rare books, including an original page from Gutenberg, to the San Francisco Public Library. Their spirit lives on in the Grabhorn Institute in the Presidio, founded in 2000 and a part of Arion Press, which declares its mission is to preserve and perpetuate one of the last integrated typefoundry, letterpress printing and bookbinding facilities as a living museum and educational center. The Grabhorn family continued to own the building at 1335 Sutter until the early 1990s. Today, the building houses the SLS Preschool, formerly St. Luke’s Preschool. SLS purchased the building a few years ago, transforming the creative, well-lit spaces once occupied by one of California’s most significant printing presses into a fun, energetic learning space for children. The building remains an excellent example of adaptive reuse, highlighting a significant San Francisco cultural and architectural landmark for future generations. Editor’s note: Some of the information in this article comes from Anne Bloomfield’s November 1996 nomination of the Grabhorn Press Building to be placed on the National Register of Historic Places. Anne Bloomfield’s monthly column, “Great Old Houses,” was published in the New Fillmore from the inaugural issue in 1986 until her death in 1999.